Thailand is the ideal jump off point for backpacking through Southeast Asia. A travel hotspot, the country has well trodden backpacker trails, perfect for first-time travellers or those new to Asia. So you ask, "If the country is so easy to travel, why read a how-to guide?" Setting expectations and arming yourself with insider travel knowledge will save you both time and baht (money). We won't bore you with details like the exchange rate or which power adapters you'll need, we'll give you the real deal type of advice you'd get from someone who has just been. Read on rookie Canadian traveller for tips to not only survive, but thrive in Thailand. Don't even thinking about bringing an expensive name brand jacket! Against all intuition a waterproof windbreaker is going to be half as effective in a Thai downpour as a $2 plastic hooded poncho. Plus, if a garment is keeping water out, it's keeping humidity in. (Read: sweat.) Buy a poncho at a stall or convenience store upon arrival. Pack one pair of footwear that has a sturdy sole. (An imperative for jungle trekking.) You'll also want them to be breathable and fit snugly. We suggest UNEEKs by KEEN. They're lighter and more waterproof than a running shoe but just as sturdy. Plus, they come in a ton of punchy colours making them instantly more stylish than a sport sandal. Opt for a backpack that's smaller than 70 litres in size. Did we mention Thailand is a hot and humid country? Schlepping around an oversize pack is going to leave you a sweaty mess. Ditch the waterproof backpack cover if you're not going to be traveling during a monsoon. The secret is to pack your items in waterproof bags within your pack. The added benefit of that is compartmentalizing your clothes. Plus, these days bags rarely (if ever) travel long distances on vehicle rooftops in Southeast Asia. PS: if you insist on using a cover, take it off during air travel. It will likely get ripped off. Dry bags. (PRO TIP!) These are the bags you typically see kayakers using back home. While the bags protect against water (perfect for river rafting and tubing in Asia), they also serve double duty as a portable beverage cooler. Fill with ice, load up and hit the beach! Purchase upon arrival if you don't already own one. Ditch the spork and refillable water bottle. Just trust us on this...you can't drink the tap water anyway. Don't go on a spending spree at home for trip clothing. Skip paying $20 for a t-shirt in Canada, instead load up on $4 tank tops on Khao San Road. 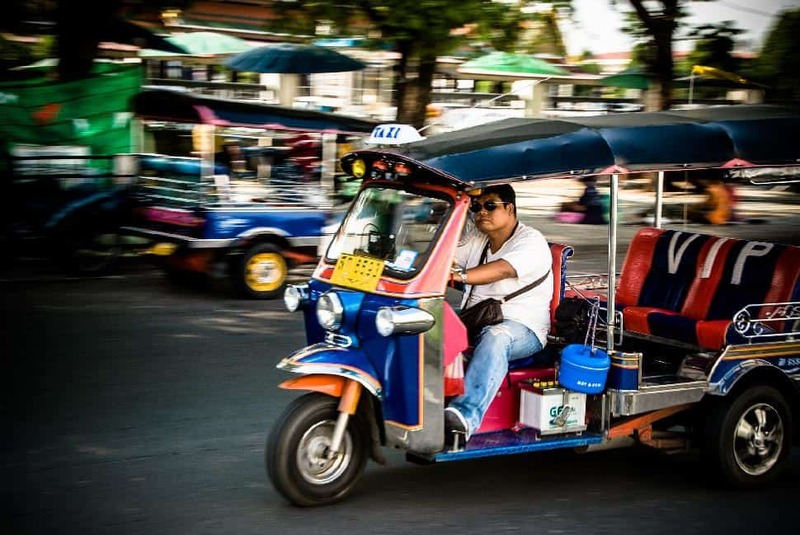 These zippy little vehicles are ubiquitous in Thailand. They operate much like a cab. If you're in a Thai city (especially in Bangkok's notorious backpacker ghetto Khao San Road) you may be offered an obscenely cheap fixed price tour. The reason? The driver will make a few pit stops along the way, typically depositing travelers in boutiques owned by vendors they know. In exchange for the foot traffic, drivers receive cash or are given fuel vouchers. Tolerant backpackers who play the part can enjoy a ride around the city while others who aren't expecting the detours will likely find the whole thing scammy. Inexplicably 7-11 convenience stores are found throughout Thailand. In Bangkok you'll find them on most city blocks. They're a great place to load up on name brand shampoo, conditioner, bottled water, exotic flavoured Pringles and cheap Sangsom rum. Grab a Big Gulp cup and mix your own to-go cocktail. Mixed drinks are popularly consumed from a sand pail. See section on full moon parties below. In Thailand, Red Bull truly gives you wings. Be careful when using it to mix drinks as it seems to have higher levels of stimulants than those regulated in Canada. Gender bending in Thailand is increasingly visible to visitors, especially south of Bangkok. Katheoy or 'lady boy' is an ambiguous term that generally refers to a male representing himself in a fashion socially identified as female. Thailand is a particularly tolerant nation and lady boys are often well represented in entertainment. While traveling in the southern islands visitors can expect to see lady boys featured prominently in cabaret style shows. We advise you catch a performance and admire the beauty of these "transformed goddesses." The less emotional you are, the more you will enjoy bartering. Determine in advance how much you are actually willing to pay for an item. If you're quoted $4 for a t-shirt but want to pay $2, your first offer shouldn't be $2. Always negotiate bus fares, excursions and hotel accommodation. Traveling with a group? Let the seller know! There always seems to be price discounts for groups of two or more, and the more nights you stay, the greater your discount should be. Etiquette says you should barter in good faith. Don't haggle if you don't intend to purchase the item. However, it is perfectly fine to enquire after a price to gauge affordability. Asking the price does not enter you into a transaction. Don't haggle aggressively over what amounts to less than a dollar. 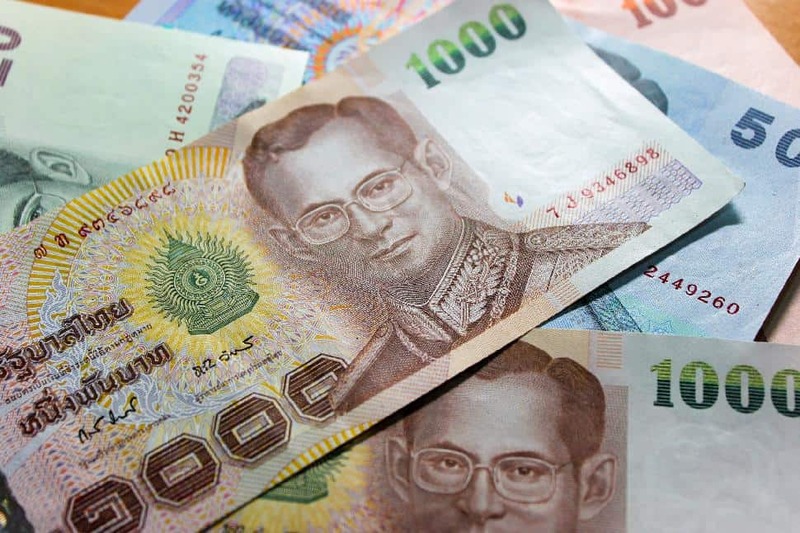 The average wage in Thailand is $150-$300/month. I personally hate traveling by taxi in Asia. What can I say, I'm jaded by having been repeatedly scammed. However, there are plenty of circumstances when taking a cab is the most convenient form of transportation. Never take an unlicensed taxi, stick to reputable companies. See more here. Never negotiate or pay for a flat fare in advance. Always insist on using the meter. Carry small bank notes as most drivers 'do not have' change. Don't put valuables in the trunk. The trunk is locked and out of reach, making it the perfect bargaining chip for predatory drivers. 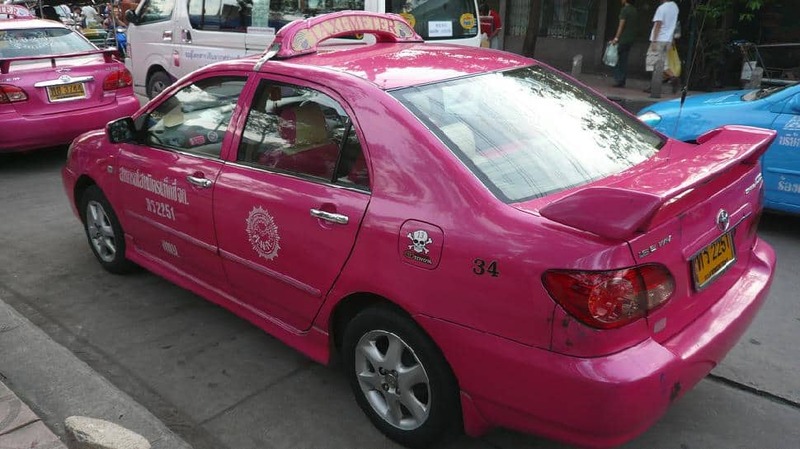 Keep an eye on the meter - if you think it is increasing suspiciously quick (a common scam in Vietnam), settle up (whatever amount you feel is fair) and change cabs if you can. If you end up in a confrontation with your cab driver, use your phone or camera to take a picture of their identification card displayed in the interior. Ensure you lock your guest room door at all times. Ensure windows are locked when you leave the room (especially if you are staying on the ground floor). Bring a combination lock, preferably one where the 'face' of the dial can not be pried off. Many budget hostels and guest houses have lockers that can be rented (in-room safes are not common). For security you will want to provide your own lock. Be wary of buses traveling from Khao San Road to the southern islands. Pack all valuables on your person. The ultra-cheap buses that run (typically overnight) from the capital to the southern islands have earned a bad reputation for theft. Bags are typically stowed below the passenger cabin and you can safely assumed that at some point during your trip they will be peeked into. Do not, in any circumstance, leave anything in your big pack that you would be upset to lose. 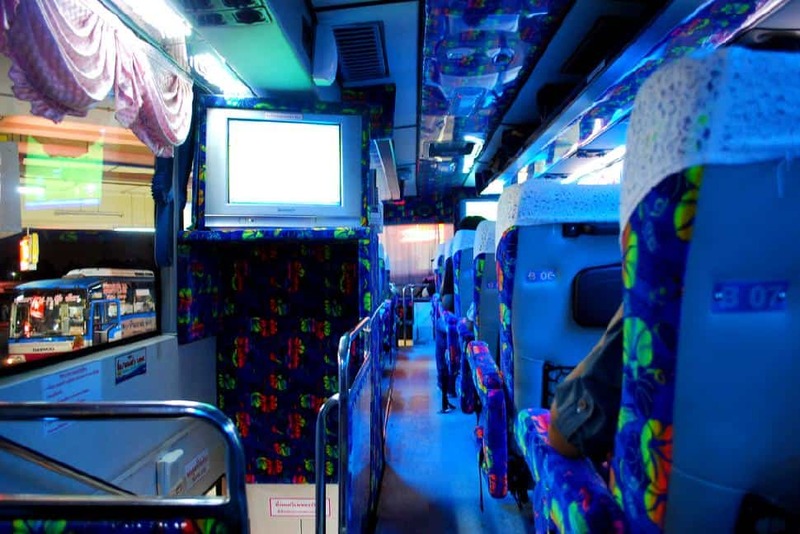 In the world of overnight bus travel we've also heard of people crawling down the aisle while passengers are asleep, lifting items that have been stowed on the ground. Avoid that by packing a silk sleeping bag liner. Keep your carry-on bag within the liner and try to get some shut-eye. Don't bring valuables to the beach. Unless you have a friend who can watch your stuff while you take a dip, don't dare leave anything of value unattended on the beach. This rookie mistake is made on beaches the world over. Full moon parties are notorious for theft. Only bring what you need and only as much cash as you will spend. Luggage locks tells thieves that you're aware of petty theft but don't think that they can't easily be picked by professionals. Never rest your chopsticks upright in a dish of food. In many Asian cultures this is symbolic in a funerary context. Never step on a coin to stop it from rolling. The royal family is revered and respected, and to step on the face of a runaway coin would be considered very offensive. Never touch the head of a Thai person or pass an item directly above one. Dress respectfully when visiting temples. Wear pants and cover the shoulders. 1. Never assume there will be a washroom on board. Carefully consider how much liquid you consumer prior to and during the trip. 2. Stock up on food. The bus will likely make a few stops but you'll be at the mercy of whichever vendor the company has negotiated a stopover with. Usually they are large, cafeteria style restaurants with disappointing food options and a host of toilets around back, which you'll have to pay to use. (Bring toilet paper!) It's best just to order a takeaway sandwich or two for the road and hit a 7-11 for snacks. 3. Wear layers. Buses often run air conditioners overnight and it can get very cold. Make sure you bring a long sleeve shirt and consider packing a sleeping bag liner. 4. Essentials: Baby wipes and/or toilet paper, earplugs, and a flashlight if you intend to read. 5. Remember, you get what you pay for. 500 baht from Bangkok to Koh Samui may be tempting but consider spending a marginal amount more to travel with a reputable company. 1. Don't show up too early. The whole point is to make it to sunrise! Eat a proper meal before departing for the party. 2. Establish a meeting point upon arrival. If you become separated you're basically looking for a needle in a human haystack. In the dark. 3. Pace yourself. It's a long night, make it a social one. Excessive partying is so much of an issue that there are on-site 'chill out zones' and clinics where dehydrated party-goers can receive IVs. Don't be one of those people. 4. The bathroom situation is a logistical nightmare, especially for girls. Bring small change to pay washroom attendants. You won't regret bringing some wipes either. 5. Do not play in the water. Not only is it full of human waste but partying and swimming are a fatal mix. 6. Yes, special shakes have drugs in them. Avoid consuming them and all other drugs. This is not the time nor the place to be experimenting. Plus, FMP are rife with undercover cops looking to bust young tourists. 7. Watch your bucket. Mixing drinks in sand pails is tradition, however such a wide brimmed vessel has distinct disadvantages. Not only is sand likely to make it into your cocktail, there's ample opportunity for your drink to be spiked. Keep a close eye on your bucket and politely decline to sip from other buckets. 8. Have fun, get painted and meet new people! Only attempt to operate a bike if you are an experienced automobile driver. Save motorbike rentals for the Thai islands or smaller northern cities (Chiang Mai, Pai, etcetera). PS - they drive on 'the other side of the street' in Thailand. Most rentals shops require you to surrender your passport as collateral. Ask other backpackers with bike rentals about reputable shops. Some people will tell you never to leave your passport as a damage deposit. This is one of those decisions you'll have to cut your backpacker teeth on, so to speak. Bikes come in automatic or manual transmission. If you're taking one on a multi-day road trip (say from Chiang Mai to Pai) vendors will only rent you a manual. Nervous about a manual transmission? Practice, practice, practice. The upside? You only shift up, not down. If you can operate a bicycle with gears, you can drive a manual scooter. Rule #1: Move like water, navigate predictably. In Canada we're used to seeing bikes in the warmer months and because there are so few of them (all things relative) we're less likely to keep them top-of-mind while driving. 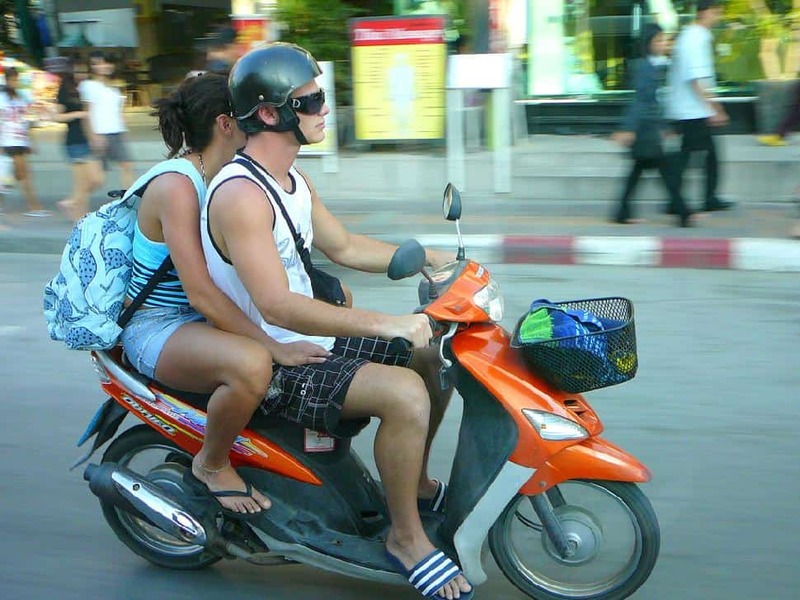 Conversely, Thai drivers are typically very conscious of motorbikes. When you're navigating, maintain good lane position and don't steer erratically. Rule #2: Don't get cocky. Overconfidence is not a virtue and in a car-meets-scooter scenario, scooter always loses. A: No. But don't worry, affordable bottled water is available everywhere. Q: Should I avoid ice? A: You may have the impression that you shouldn't consume ice in foreign countries from media or advertising. Blended ice drinks and iced coffee are common throughout Southeast Asia, and if you're spending an extended length of time in the region we suspect you'll become comfortable consuming it. The standard way to tell if ice has been made from filtered water is if the cube has a hole in it. Due to the fact that tap water is not potable, it makes no sense that local restaurants would make ice from it. At the end of the day, if you aren't comfortable with consuming something (whether it be ice, meat or street food) then it's quite simple - don't. Q: Are there laundromats? How will I clean my clothes? A: Oh newbie backpacker, it's so much better than you can imagine. Have your clothes laundered for you for about one dollar per pound. Q: What's the best place to learn to dive? Q: What should I do for cash? A: ATMs are plentiful. Ask your bank in advance what type of fees you will incur each time you withdraw money. Advise them of your plans to travel, and don't forget to call your credit card provider to set a travel note on your account. Failure to do so may freeze your card as a sudden, foreign transaction may appear fraudulent to the system. Q: I only have two weeks, where should I go? Q: How do I pronounce Phuket and Koh Phi Phi? Q: What food should I eat? Have you backpacked Thailand? What advice would you give to a novice traveller? Leave a tip or comment below! This Thailand backpacking article was brought to you by our friends at KEEN. 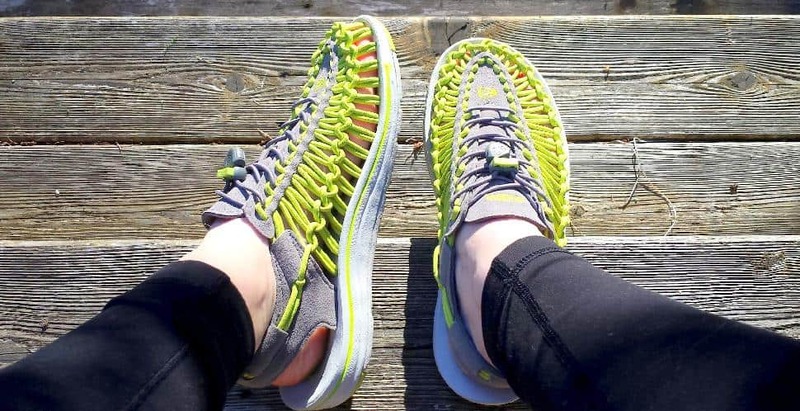 We're enjoying their newest design, UNEEK, described as 'open air footwear.' When it comes to backpacking we look for practical footwear that is comfortable for all day wear, has a sturdy sole for trekking, and lets our feet breath. UNEEKs perfectly fit the bill and with a funky design they don't forfeit style.